No one will be able to correctly pronounce it from the label (it's pronounced mah-gay for the record) but everyone will be talking about Villa de Patos new superfood products obtained from the maguey plant, which is native to the arid highlands of Mexico. Since ancient times, the maguey plant has served as a source of nourishment, shelter and textiles for the people of Mexico. The Aztecs worshipped the maguey as the goddess Mayahuel, naming it the Plant of the Gods because of its alleged medicinal properties. Rich in phytonutrients, antioxidants, vitamins, minerals and prebiotic fibers, the sap brings nutritional benefits to everyday recipes. Prebiotic fibers balance the ecosystem of intestinal flora while serving as “food” for probiotics. 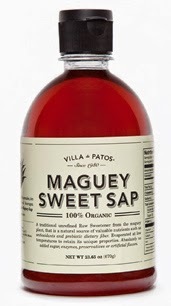 Maguey Sweet Sap is a unique organic sweetener, not only full of flavor, but also all-natural, minimally processed and the first of its kind to offer prebiotic dietary fiber. Think of it as a new alternative sweetener that’s actually good for your gut. Visit their website to get recipes using this product. 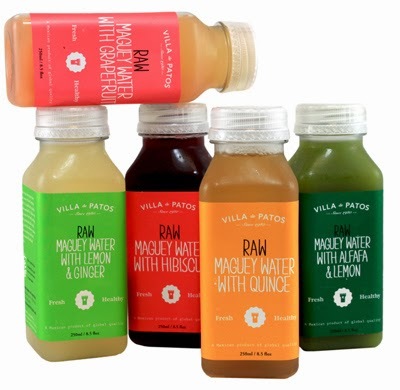 Villa de Patos also uses the maguey plant to create refreshing all-natural beverages (called Maguey Waters) with colorful flavor combinations including: Alfalfa and Lemon; Grapefruit; Quince; Hibiscus; Lemon and Ginger. A little known interesting fact, according to the reputable organization Bat Conservation International, is that Northern Mexico’s maguey plants and the long-nosed bats of Texas have a symbiotic relationship, relying heavily on each other to exist. In fact, Bat Conservation International states that scientists believe this association is the result of the coevolution of bats and plants. The dependence is so strong that the plants could not reproduce without the intervention of the bats, which would starve to death if the plants were not present. They've picked Dallas as the spot to build their US headquarters. Fitting since everything is bigger and better in Texas - including the foods we eat! You can purchase the all-natural Maguey Juices and Maguey Sweet Sap in Central Market locations across the state. Visit http://villadepatos.com for more information and recipes.